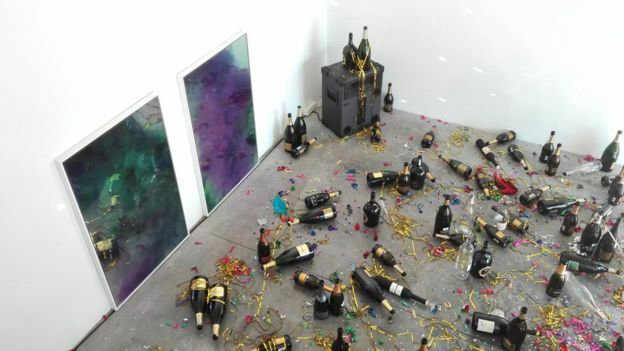 A Champagne-filled art installation was mistakenly thrown away by a cleaner who thought there had been a party at the gallery the night before. As reported by the BBC, the exhibit, named “Where shall we go dancing tonight?” had been on display at the Museion Bozen-Bolzano in Milan. Formed of empty Champagne bottles, party poppers, streamers and cigarette butts, the exhibit was tidied away by the cleaner who separated the glass, plastic and paper into individual bags. The work, created by two Milanese artists to reflect the hedonism of the 1980s, has since been reinstalled at the gallery and is open to the public.